فاضلاب بیمارستانی جزو فاضلاب شهری ناخالص محسوب می‌شود که با توجه به گستردگی بیمارستان و تنوع بخش‌های درمانی آن و در نتیجه آلاینده‌های مختلف موجود در فاضلاب‌های بیمارستانی، تعیین ضرایب سینتیکی و راهبری تصفیه‌خانه فاضلاب بیمارستان از اهمیت زیادی برخوردار است. یکی از مهم‌ترین روش‌های تصفیه فاضلاب بیمارستانی، سیستم لجن فعال با هوادهی گسترده است. این پژوهش با هدف انتخاب مناسب ضرایب سینتیکی و راهبری تصفیه‌خانه فاضلاب بیمارستان در شرایط آب و هوای گرم انجام شد.در این پژوهش نمونه‌برداری در طی 6 ماه در فاصله دی 1392 تا خرداد 1393 انجام شد و پارامترهای TSS، COD، BOD5، pHوکدورت در فاضلاب خام ورودی و خروجی از تصفیه‌خانه و MLVSS و MLSSو اکسیژن محلول در حوض هوادهی و میزان لجن برگشتی به راکتور اندازه‌گیری و با تعیین پارامترهای راهبری و بهره‌برداری از قبیلSVI، F/M، qcدرحوضچه هوادهی، در نهایت ضرایب سینتیکی Kd، KS، Yو µmaxبا استفاده از معادلات اصلاح شده مونود محاسبه شد. نتایج این مطالعه نشان داد که میانگین ضرایب سینتیکی در فرایند بیولوژیکی لجن فعال با هوادهی گسترده در فاضلاب بیمارستانی مورد مطالعه برابر با : K=2.19d-1، Ks= 9.74(mg/L) ، Y=0.39gBiomass/gBOD5، Kd=0.06d-1،mmax=0.85d-1محاسبه شد. از ضرایب سینتیکی به‌دست آمده در این تحقیق می‌توان به‌منظور طراحی و همچنین راهبری و بهره‌برداری تصفیه‌خانه‌های فاضلاب بیمارستان‌ها به روش لجن فعال هوادهی گسترده به‌ویژه در مناطق گرمسیری استفاده نمود. Hospital effluents are regarded as a kind of municipal wastewater laden with additional pollutants due to the variety of wards and therapeutic activities in a hospital. This makes the determination of kinetic coefficients and parameters of utmost importance for the successful operation and maintenance of hospital wastewater treatment facilities. Extended aeration activated sludge is one of the most important processes employed in such facilities. The present study is an effort to determine these parameters for the operation of such a facility operating in hot climate conditions. For this purpose, samples of both hospital raw wastewater and plant effluent were taken during a 6-month period from January to June 2014 to determine their BOD5, COD, TSS, PH, and Turbidity. Moreover, MLSS, MLVSS, and DO in the aeration tank as well as the sludge return ratios were measured. Such operation and maintenance parameters as θc, F/M, and SVI were then calculated and the equations of the modified Monod Model were used to calculate the values of the kinetic coefficients such as Y, K, KS, Kd, and µmax for the extended aeration activated sludge process at the hospital wastewater treatment plant as follows: K= 2.19 d-1, Ks=90.74 mg/l, Y = 0.39 g Biomass/g BOD5, Kd = 0.06 d-1, and µmax =0.85 d-1. The results obtained can be usefully exploited for designing similar extended aeration activated sludge processes for the treatment of hospital effluents, especially for those operating in hot climates. American Public Health Asociation (APHA). 2005, Standard methods for the examination of water and wastewater, 21th Ed., Washington, DC, USA. Chow, V.T., Eliassan, R. & Linsley, R.K., 2006, Wastewater engineering, McGraw-Hill, New York. Fazelipour, M., Takdastan, A. & Sekhavatjo, M., 2011, "Survey on chlorine application in equencing batch reactor waste sludge in order to sludge minimization", Asian Journal of Chemistry, 23, 2994-2998. Hennz, M. and Harremoes, P., 2006, "Characterization of wastewater for modeling of activated sludge processes", Journal Water Science Technology, 25 (6), 1-15. Majlesi Nasr, M. & Yazdanbakhsh, A.R., 2008, "Study on wastewater treatment systems in hospitals of Iran", Iranian Journal Environmental Health, Sciecne Engineering, 5(3), 211-215. Mardani, S.H., Mirbagheri, A., Amin, M.M. & Ghasemian, M., 2009, "Determination of biokinetic coefficients for activated sludge processes on municipal wastewater", Iranian Journal Environmental Health Science Engineering, 8, 25-34. Mesdaghinia, A.R., Naddafi, K., Nabizadeh, R., Saeedi, R. and Zamanzadeh, M., 2009, "Wastewater characteristics and appropriat method for wastewater management in the hospitals", Iranian Journal Public Health, 38(1), 34-40. Mosavian, S., Takdastan, A. & Seyedsalehi, M., 2016, "Determining the kinetic’s coefficients in treatment of sugarcane industry using aerobic activated sludge by complete-mix Regime", Journal of Chemical and Pharmaceutical Research, 8 (4), 1342-1349. Mostaed, S., Amin, M.M., Hassani, A. & Takdastan, A., 2010, "Anaerobic biofilm reactor system efficeinyc in sugar cane industry wastewater treatment", Journal of Health System Reserarch, 6, 1002-1014. Sarafraz, Sh., Khani, M.R. & Yaghmaeian, K., 2006, "Quality and quantity survey of hospital wastewaters in Hormozgan province", Iranian Journal of Environmental Health Science Engineering, 4(1) 43-50. 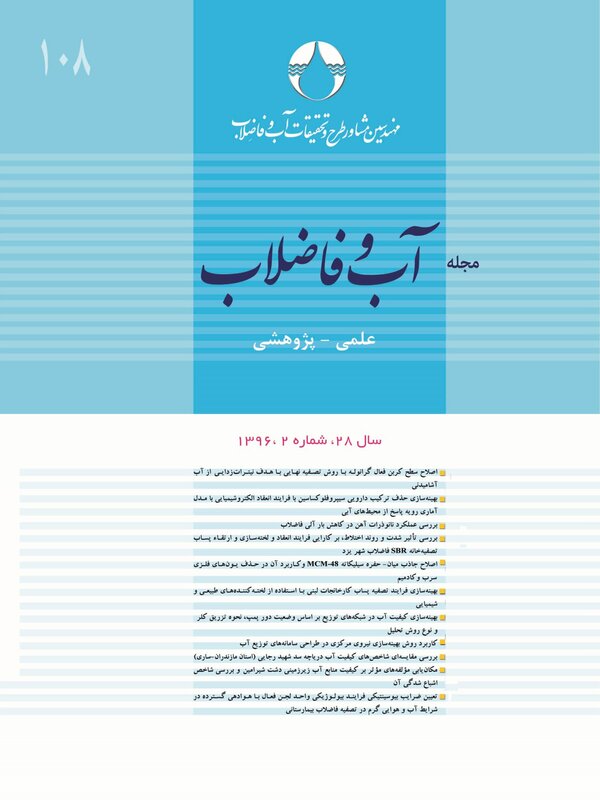 Taghavizadeh, S., Takdastan, A., Mohammadi, M. & Montazerizadeh, S., 2013, "Evaluate the performance of sewage treatment plants and specialized hospital in Ahvaz in October", Torbat University of Medical Sciences Journal, 2(1), 47-54. Takdastan, A. & Eslami, A., 2013, "Application of energy spilling mechanism by para-nitrophenol in biological excess sludge reduction in batch-activated sludge reactor", International Journal of Energy and Environmental Engineering,Vol. 4,No. 4 (26), 1-7. Takdastan, A. & Pazoki, M., 2011, "Study of biological excess sludge reduction in sequencing batch reactor by heating the reactor", Asian Journal of Chemistry, 23, 29-33. Takdastan, A., Mehrdadi, N. & Torabian, A., 2011, "An investigation on the efficiency of SBR In different operation conditions", Journal of Environmental Science and Technology, Vol. 13 , No. 2 (49), 1-12. Takdastan, A., Mehrdadi, N., Azimi, A. A. & Torabian, A., 2009, "Investigation of intermittent chlorination system in biological excess sludge reduction by sequencing batch reactors", Iranian Journal Environmental Health Science Engineering, 6, (1), 53-60. Takdastan, A., Mehrdadi, N., Azimi, A. A. & Torabian, A., 2010, "Investigation of the excess sludge reduction in SBR by oxidizing some sludge by ozone", Iranian Journal of Chemistry and Chemical Engineering (IJCCE), 2(4), 95-104. Takdastan, A., Movahedian, H. & Bina, B., 2005, "The efficiency of anaerobic digesters on microbial quality of sludge in Isfahan and Shahinshahr wastewater plant",Iranian Journal Environmental Health Science Engineering, 2(1), 56-59. Tchobanoglous, G., Burton, F.L. & Stensel, H.D., 2003, Wastewater engineering treatment and reuse, 4th Ed., McGraw-Hill, Metcalf and Eddy Inc., New Dehli.